This article is about the former Philippine president. For other people of the same name, see Benigno Aquino. In this Philippine name, the middle name or maternal family name is Cojuangco and the surname or paternal family name is Aquino. Benigno Simeon Cojuangco Aquino III (born February 8, 1960) is a Filipino politician who served as the 15th President of the Philippines from 2010 until 2016. Aquino is a fourth-generation politician and the chairman of the Liberal Party from 2010 to 2016. On September 9, 2009, shortly after the death of his mother, Aquino officially announced he would be a candidate in the 2010 presidential election. He was elected and on June 30, 2010 was sworn into office as the fifteenth President of the Philippines at the Quirino Grandstand in Rizal Park, Manila, succeeding Gloria Macapagal-Arroyo. He ended his term on June 30, 2016, succeeded by Rodrigo Duterte. In 2013, Time named him one of the 100 Most Influential People in the World. Benigno Simeon "Noynoy" Aquino III was born at 10:28 am on February 8, 1960 at Far Eastern University Hospital in Sampaloc, Manila. He is the third of the five children of Benigno S. Aquino, Jr., who was then the Vice Governor of Tarlac province, and Corazon Cojuangco, daughter of a prominent Tarlac businessman. He has four sisters, namely: Maria Elena (Ballsy), Aurora Corazon (Pinky), Victoria Elisa (Viel), and Kristina Bernadette (Kris). He attended Ateneo de Manila University in Quezon City for his elementary, high school, and college education. Aquino finished his Bachelor of Arts (major in economics) from Ateneo de Manila University in 1981, He was one of the students of former professor of economics at Ateneo de Manila University, former President Gloria Macapagal-Arroyo. He joined his family in their exile in the United States shortly thereafter. He returned to the Philippines in 1983 shortly after the assassination of his father and held several positions working in the private sector. In September 1972, Aquino's father, who was then a senator and prominent opposition leader to President Ferdinand Marcos, was arrested for subversion. In August 1973, Aquino's father was brought before a military tribunal in Fort Bonifacio. In 1980, after a series of heart attacks, Aquino's father was allowed to seek medical treatment in the United States, where Aquino's family began a period of self-exile. In 1981, shortly after graduation, Aquino joined his family in the United States. In 1983, after three years in exile in the United States, Aquino's family returned to the Philippines, shortly after the assassination of his father on August 21, 1983. He had a short tenure as a member of the Philippine Business for Social Progress, working as an assistant of the executive director of PBSP. He later joined Mondragon Industries Philippines, Inc. as an assistant Retail Sales Supervisor and assistant promotions manager for Nike Philippines, Inc.
On August 28, 1987, eighteen months into the presidency of Aquino's mother, rebel soldiers led by Gregorio Honasan staged an unsuccessful coup attempt, attempting to lay siege to Malacañang Palace. Aquino was two blocks from the palace when he came under fire. Three of Aquino's four security escorts were killed, and the last was wounded protecting him. He himself was hit by five bullets, one of which is still embedded in his neck. From 1993 to 1998, he worked for Central Azucarera de Tarlac, the sugar refinery in the Cojuangco-owned Hacienda Luisita. He was employed as the executive assistant for administration from 1993 to 1996 and subsequently worked as manager for field services from 1996 to 1998. In 1998, he was elected to the House of Representatives as Representative of the 2nd district of Tarlac province. He was subsequently re-elected to the House in 2001 and 2004. In 2007, having been barred from running for re-election to the House due to term limits, he was elected to the Senate in the 14th Congress of the Philippines. Aquino is a fourth-generation politician: his great-grandfather, Servillano "Mianong" Aquino, served as a delegate to the Malolos Congress; his paternal grandfather, Benigno Aquino, Sr., served as Speaker of the House of Representatives of the Philippines from 1943 to 1944; his maternal grandfather, Jose Cojuangco, was also a member of the House of Representatives; and his parents were Corazon Aquino, who served as the 11th President of the Philippines (1986–92), and Senator Benigno "Ninoy" Aquino, Jr. Aquino is a member of the Liberal Party, where he held various positions such as Secretary General and Vice President for Luzon. Aquino became Deputy Speaker of the House of Representatives on November 8, 2004, but relinquished the post on February 21, 2006, when Aquino joined his Liberal Party members in calling for the resignation of President Gloria Macapagal-Arroyo at the height of the Hello Garci scandal. Aquino was also Chairman of the Board of the Central Luzon Congressional Caucus. Barred from running for re-election to the House of Representatives of the Philippines, to represent the 2nd district of Tarlac, due to term limits, Aquino was elected to the Senate of the Philippines in the 2007 Philippine midterm election on May 15, 2007, under the banner of the Genuine Opposition (GO), a coalition comprising a number of parties, including Aquino's own Liberal Party, seeking to curb attempts by President Gloria Macapagal-Arroyo to amend the 1986 Philippine Constitution. In Aquino's political ads, he was endorsed by his younger sister, TV host Kris Aquino, and his mother, the late former President Corazon Aquino. Although a Roman Catholic, Aquino was endorsed by the pentecostal Jesus Is Lord Church, one of the largest Protestant churches in the Philippines. With more than 14.3 million votes, Aquino's tally was the sixth highest of the 37 candidates for the 12 vacant seats elected from the nation at large. Aquino assumed his new office on June 30, 2007. "I endorse Honasan's request for bail para parehas ang laban [to even out the playing field]. I was hit by bullets from Honasan's men in the neck and hips but that's past now. The principle of my father was, 'Respect the rights even of your enemies.' Ito ang nagpatingkad ng demokrasya [This is what defines democracy]. Genuine reconciliation is democracy in action." Aquino was referring to an unsuccessful coup attempt staged by rebel soldiers led by Gregorio Honasan on August 28, 1987, in which Aquino was seriously injured. The Budget Impoundment and Control Act (SB 3121), wherein "impoundment" refers to the power of the president to refuse the release of funds appropriated by the Congress of the Philippines, is another bill Aquino is proud of; he regretted, however, that such power has been used and abused by President Gloria Macapagal-Arroyo, a result of which abuse has been the significant emasculation of Congress' ability to check the president's authority. Aquino filed this bill so the president would have to pass through Congress every time the president decides to impound part of the budget. Another significant Aquino contribution to the Philippines' corruption problem was Senate Bill 2035, which is the Preservation of Public Infrastructures bill, seeking to raise standards in the construction of all public infrastructures by penalizing contractors of defective infrastructures. The bill also requires the Bureau of Maintenance under the Department of Public Works and Highways to conduct periodic inspections of public infrastructures. Aquino also pushed for the passage of the Amending the Government Procurement Act (SB 2160), which applies to all government procurement activities regardless of source of funds whether local or foreign; only treaties or international/executive agreements entered into by the government prior to its enactment shall be exempt from coverage. The bill was filed in light of the Department of Justice declaration regarding the validity of the controversial NBN-ZTE scandal, wherein its international aspect, as well as the fact that it was an executive agreement, was cited as one reason for its exemption from the procurement process stipulated in Republic Act 9184. Focusing further on accountability in government appropriations and spending, Aquino filed other reform-oriented bills, among which were Philippine National Police reform; an increase in penalties for corporations and work establishments not compliant with minimum wage; the banning of reappointment to the Judicial and Bar Council; the prevention of reappointment and bypassing of the Commission on Appointments; real property valuation based on international standards; and superior responsibility for senior military officers, who are ultimately responsible for their own subordinates. However, none of these bills were passed into law. Aquino being proclaimed as the President-elect of the Philippines by President of the Senate of the Philippines Juan Ponce Enrile and House Speaker Prospero Nograles at the Batasang Pambansa in Quezon City on June 9, 2010. 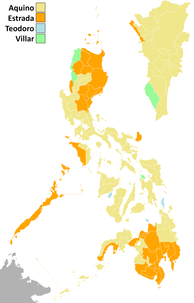 Map of dignitaries who attend Aquino's inauguration. On November 26, 2008, the Liberal Party elected Mar Roxas, president of the Liberal Party, as the standard-bearer of the Liberal Party for President of the Philippines in the then-upcoming 2010 presidential elections. Following the death and funeral of Aquino's mother, former President Corazon Aquino, many people began calling on Aquino to run for President of the Philippines. This groundswell of support became known as the "Noynoy Phenomenon". On August 27, 2009, Edgardo "Eddie" Roces, son of the late Chino Roces, former publisher and owner of The Manila Times, and a group of lawyers and activists formed the Noynoy Aquino for President Movement (NAPM), a nationwide campaign to collect a million signatures in order to persuade Aquino to run for president, reminiscent of Roces' father, who on October 15, 1985, launched the Cory Aquino for President Movement (CAPM), collecting more than one million signatures nationwide, asking Aquino's mother to run against Ferdinand Marcos in the 1986 presidential snap elections. In September 2009, the Liberal Party held numerous press conferences in relation to the 2010 elections at the Club Filipino in Greenhills, San Juan, the site of the presidential inauguration of Aquino's mother in February 1986. On September 1, 2009, at the Club Filipino, in a press conference, Senator Mar Roxas, president of the Liberal Party, announced his withdrawal from the 2010 presidential race and expressed his support for Aquino, as the party standard-bearer instead. Aquino later stood side by side with Roxas, but did not make a public statement at the press conference. The next day, Aquino announced that he would be going on a "spiritual retreat" over the weekend to finalize his decision for the elections, visiting the Carmelite sisters in Zamboanga City. reminiscent of his mother's own soul-searching in 1985 before deciding to run for the elections the following year. He came back on September 9 to formally announce his candidacy. Almost two weeks later, Roxas pledged to run alongside Aquino as the Liberal Party standard-bearer for vice-president. The two men filed their respective certificates of candidacy for president and vice-president on November 28, 2009. Fake psychiatric reports on Aquino's mental health began circulating online during the 90-day election campaign period from February 9 – May 8, 2010, Aquino received information that the first such report came from the wife of Nacionalista Party supporter and former National Power Corporation (NAPOCOR) president Guido Delgado, a move Aquino claims was made with "malicious intent". A second report came from an unidentified supporter of Senator Manny Villar, the Nacionalistas' leader and presidential candidate. Later presented by Delgado at a press conference, the psychiatric report was supposedly signed by Father Jaime C. Bulatao, S.J., PhD, a Jesuit priest, a professor of Psychology and a clinical psychologist at the Ateneo de Manila University, taken when Aquino was finishing his Bachelor's degree in economics at the university in 1979. It reportedly showed that Aquino suffered from depression and melancholia, the priest later denied writing the document at all. Another supposed psychiatric report that later surfaced claimed that Aquino suffered from major depressive disorder; the report's supposed author, Jesuit priest Father Carmelo A. Caluag II, denied writing any evaluations of Aquino. The university's psychology department later debunked the documents, with Aquino labelling them as another desperate effort by rivals to malign his reputation. During the campaign, Senator Francis Escudero began endorsing Aquino as president and PDP-Laban standard-bearer Jejomar Binay, for Vice President, launching the Aquino-Binay campaign. However, this was done without the consent of the two candidates; Binay was former President Joseph Estrada's running mate for vice-president. During the 2010 presidential election, held on May 10, 2010, in unofficial tallies, conducted by the Commission on Elections (COMELEC) and the Parish Pastoral Council for Responsible Voting (PPCRV), Aquino was the leading candidate in tallied votes for president, and in the official Congressional canvass, Aquino was the leading candidate in canvassed votes for president. Aquino was unofficially being referred to as "president-apparent" by the media. On June 9, 2010, at the Batasang Pambansa Complex, in Quezon City, the Congress of the Philippines proclaimed Aquino as the President-elect of the Philippines, following the 2010 election with 15,208,678 votes, while Jejomar Binay, the former mayor of Makati City, was proclaimed as the Vice President-elect of the Philippines with 14,645,574 votes, defeating runner-up for the vice presidency Mar Roxas, the standard-bearer of the Liberal Party for vice president. 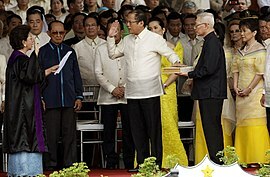 Benigno Aquino III takes the oath of office as the 15th President of the Philippines before Associate Justice Conchita Carpio-Morales at the Quirino Grandstand on June 30, 2010. The Presidency of Benigno S. Aquino III began at noon on June 30, 2010, when he became the fifteenth President of the Philippines, succeeding Gloria Macapagal-Arroyo. Since the start of his presidency, he has also been referred to in the media as PNoy. The presidential residence of Aquino is Bahay Pangarap (English: House of Dreams), located inside of Malacañang Park, at the headquarters of the Presidential Security Group across the Pasig River from Malacañang Palace. Aquino is the first president to make Bahay Pangarap his official residence. Malacañang Park was intended as a recreational retreat by former President Manuel L. Quezon. The house was built and designed by architect Juan Arellano in the 1930s, and underwent a number of renovations. In 2008, the house was demolished and rebuilt in contemporary style by architect Conrad Onglao, a new swimming pool was built, replacing the Commonwealth-era swimming pool. The house originally had one bedroom, however, the house was renovated for Aquino to have four bedrooms, a guest room, a room for Aquino's household staff, and a room for Aquino's close-in security. The house was originally intended as a rest house, the venue for informal activities and social functions for the First Family by former President Manuel L. Quezon. Malacañang Park was refurbished through the efforts of First Lady Eva Macapagal, wife of former President Diosdado Macapagal, in the early 1960s. First Lady Macapagal renamed the rest house as Bahay Pangarap. During the presidency of Fidel V. Ramos, the house was restored and became the club house of the Malacañang Golf Club. The house was used by former President Gloria Macapagal-Arroyo to welcome special guests. Aquino refused to live in Malacañang Palace, the official residence of the President of the Philippines, or in Arlegui Mansion, the residence of former presidents Corazon Aquino and Fidel V. Ramos, stating that the two residences are too big, and also stated that his small family residence at Times Street in Quezon City would be impractical, since it would be a security concern for his neighbors. Under Secretary of State for Political Affairs William Joseph Burns (middle) shakes hands with President Benigno S. Aquino III (right) as United States Ambassador to the Philippines Harry K. Thomas, Jr. (left) looks on. On June 29, 2010, Aquino officially named the members of his Cabinet, with Aquino himself as Secretary of the Interior and Local Government, a position that Vice President-elect Jejomar Binay initially wanted; however, Aquino stated that the post was not being considered for him. He instead offered Binay various positions, such as head of a commission to investigate the outgoing Arroyo administration, the posts of Secretary of Agrarian Reform, chairman of the Housing and Urban Development Coordinating Council (HUDCC), and the chairman of Metropolitan Manila Development Authority (MMDA), but Binay refused. Aquino also announced the formation of a truth commission that will investigate various issues including corruption allegations against outgoing President Gloria Macapagal-Arroyo. Aquino named former Chief Justice Hilario Davide, Jr. to head the truth commission. Traditionally, it is the Chief Justice of the Supreme Court of the Philippines who administers the oath of office to the incoming president and vice president, however, Aquino refused to allow Chief Justice Renato Corona to swear him into office, due to Aquino's opposition to the midnight appointment of Corona by outgoing President Gloria Macapagal-Arroyo on May 12, 2010, two days after the 2010 elections and a month before Arroyo's term expired. Instead, Aquino formally requested Associate Justice of the Supreme Court of the Philippines Conchita Carpio-Morales, who opposed the midnight appointment of Corona, to swear him into office. During the inaugural address, Aquino created the "no wang-wang" policy, strengthening the implementation of Presidential Decree No. 96. The term ‘wang-wang’ is street lingo for blaring sirens. Presidential Decree No. 96 was issued on January 13, 1973 by former President Ferdinand Marcos, regulating the use of sirens, bells, whistles, horns and other similar devices only to motor vehicles designated for the use of the president, vice president, senate president, House Speaker, chief justice, Philippine National Police, Armed Forces of the Philippines, National Bureau of Investigation, Land Transportation Office, Bureau of Fire Protection and ambulances. However, despite having the privilege of using ‘wang-wang’, Aquino maintained he would set the example for his no ‘wang-wang’ policy, not to use ‘wang-wang’, even if it means being stuck in traffic and being late every now and then. Aquino also traded the official black presidential Mercedes Benz S-Guard limousine for his own white Toyota Land Cruiser 200. After the inaugural address, the Metropolitan Manila Development Authority began to enforce Aquino's no ‘wang-wang’ policy, confiscating ‘wang-wang’ from public officials and private motorists who illegally used them. On July 26, 2010, at the Batasang Pambansa, in Quezon City, Aquino delivered his first State of the Nation Address (SONA). During Aquino's first State of the Nation Address (SONA), Aquino announced his intention to reform the education system in the Philippines by shifting to K–12 education, a 12-year basic education cycle. K–12 education is used in the United States, Canada, and Australia. On July 29, 2015, Aquino delivered his final SONA address, where he discussed the country's economic improvements and the benefits of social service programs, particularly the Pantawid Pamilyang Pilipino Program and the Philippine Health Insurance Corporation, during the course of his presidency. President Aquino with Japanese Emperor Akihito and Empress Michiko on January 27, 2016. On September 3, 2010, Aquino took responsibility for the crisis. Aquino actually has direct supervision of the Philippine National Police, since Aquino had asked Secretary of the Interior and Local Government Jesse Robredo to address other concerns, such as coming up with a comprehensive plan on delivering social services to and relocating informal settlers in coordination with the local governments. President Aquino's administration was criticised during and after Typhoon Haiyan (Yolanda) in November 2013 for the government's "slow" response to aid the victims. This criticism resulted in countries like Canada to provide humanitarian aid to the victims of the typhoon through non-governmental organizations and not the Philippine government, wherein the Canadian Ambassador to the Philippines, Neil Reeder cited "the speed, because of the need to move quickly, and because we don’t, as a government, want to be involved in the details, nor do we think it’s efficient to have other governments involved." President Aquino was accused of evading responsibility for the death of 44 Special Action Force operatives in a failed operation, which led to the so-called Mamasapano massacre. Noynoying (pronounced noy-noy-YING or noy-NOY-ying) is a protest tactic in the form of a neologism that Aquino's critics have used to question his work ethic, alleging his inaction on the issues of disaster response and rising oil prices. A play on the term planking and Aquino's nickname, Noynoying involves posing in a lazy manner, such as sitting idly while resting his head on one hand, and doing nothing. Maria Lourdes Sereno – August 13, 2010 (as Associate Justice); August 25, 2012 (as Chief Justice). Following the turnover ceremonies to his successor Rodrigo Duterte at Malacañang, Aquino returned to his parents' residence along Times Street, Quezon City. Since leaving office, Aquino remained silent on the Duterte administration and rarely made public appearances. However, in November 2016, Aquino attended a concert at Rizal Park and joined protests against the burial of Ferdinand Marcos. In February 2017, Aquino commemorated the 31st anniversary of the People Power Revolution by marching to the People Power Monument and joining the protests against the Ferdinand Marcos regime. In July 2017, criminal charges were filed against Aquino for usurpation of authority under the Revised Penal Code and violating anti-graft and corruption laws. Ombudsman Conchita Carpio-Morales cited the involvement of then suspended Philippine National Police chief Alan Purisima in the 2015 Mamasapano police operation against the Bangsamoro Islamic Freedom Fighters and the Moro Islamic Liberation Front in Mamasapano, Maguindanao, where 44 Special Action Force members were killed. Under the Revised Penal Code, suspended public officials cannot perform their duties or interfere in government affairs. Aquino's former Deputy Presidential Spokesperson Abigail Valte said that Aquino plans to file a motion for reconsideration to appeal the charges. In 2018 Aquino was indicted in a $1.35 billion criminal case involving a congressional approval to use state funds on major government projects. Aquino has never married and has no children, making him the Philippines' first bachelor president. Aquino previously had a relationship with Shalani Soledad, a Valenzuela councilor and niece of former Senator Francisco Tatad. In November 2010, Aquino confirmed that he and Soledad had broken up. He had previously dated Korina Sanchez, Bernadette Sembrano, and Liz Uy. He was also in a relationship with Korean television host Grace Lee. Aquino has stated his preference for younger women because he wants to have children. Aquino was also enthusiast of shooting, billiards and video games. Aquino does not drink alcoholic beverages, but is a smoker. Aquino also said that he is not keen on being a poster boy for anti-smoking campaigns. Upon winning the election, Aquino was phoned by U.S. President Barack Obama, who congratulated him and offered assistance to smoking cessation. Although the official residence of the president is the Malacañang Palace, Aquino chose to reside in the Bahay Pangarap (House of Dreams), located within the Palace grounds, while in office. These are the list of honours and awards made by President Aquino. ^ a b "Philippines, Manila, Civil Registration, 1899-1994 Image Philippines, Manila, Civil Registration, 1899-1994; pal:/MM9.3.1/TH-1-14066-40597-86 — FamilySearch.org". Retrieved January 26, 2015. ^ a b "Senator Benigno S. Aquino III". Senate of the Philippines. Archived from the original on February 9, 2010. ^ a b c Quezon, Manuel L.. (June 19, 2010) Trivia on Aquino and Binay. ABS-CBN News. Retrieved on January 23, 2012. ^ a b c d e f g h i j k l m n o p q "Official Program Aquino Inaugural (Excerpts)". Archived from the original on February 12, 2015. Retrieved September 8, 2017. ^ a b c "Aquino promises justice as Philippines president – Yahoo! News". June 9, 2010. Archived from the original on June 15, 2010. ^ a b c "Congress final tallies". INQUIRER.net. June 8, 2010. Archived from the original on August 22, 2010. ^ a b c "Resume of Senator Aquino – Senate of the Philippines". Archived from the original on June 14, 2010. ^ a b Noynoy Aquino to take oath at the Luneta grandstand | GMA News Online. Gmanetwork.com (June 15, 2010). Retrieved on January 23, 2012. ^ "The 100 Most influential people in the world". Time. April 18, 2013. ^ a b c d e f g The son also rises: Who is Noynoy Aquino? | GMA News Online . Gmanetwork.com (September 9, 2009). Retrieved on January 23, 2012. ^ Pazzibugan, Dona (August 21, 2007). "Noynoy Aquino also rises". INQUIRER.net. ^ a b 'Noynoy' poised to run for president. ABS-CBN News. Retrieved on January 23, 2012. ^ "11 days to E-Day". GMANews.TV. May 3, 2007. ^ "JIL backs Loren, Noynoy, Koko, Kiko in Senate race". GMANews.TV. May 3, 2007. ^ "Brother Eddie Villanueva endorses 3 more GO bets". May 3, 2007. Archived from the original on September 26, 2007. ^ Tabada, Job (March 5, 2007). "Reconcile this". Cebu Daily News. Archived from the original on August 22, 2010. ^ "Roxas is new LP President". Manila Bulletin. November 27, 2007. Archived from the original on June 7, 2011. ^ "Candidate Profiles: Benigno Simeon 'Noynoy' Cojuangco Aquino III". The-diplomat.com. Archived from the original on April 12, 2010. ^ "'Noynoy for President' signature drive launched". ABS-CBN News. August 27, 2009. ^ "About – Noy Aquino for President Movement". Archived from the original on August 16, 2011. ^ Roxas throws support for Aquino in 2010 – INQUIRER.net, Philippine News for Filipinos Archived September 4, 2009, at the Wayback Machine. Newsinfo.inquirer.net. Retrieved on January 23, 2012. ^ Noynoy to go on 'retreat' before baring 2010 plans | GMA News Online. Gmanetwork.com (September 2, 2009). Retrieved on January 23, 2012. ^ Ager, Maila (September 9, 2009). "Aquino declares presidential bid". INQUIRER.net. Archived from the original on February 6, 2010. ^ "Liberal Party launches Aquino-Roxas tandem for 2010". Sun.Star. Archived from the original on December 26, 2009. ^ a b "Campaign period ends at midnight; liquor ban on". May 8, 2010. ^ a b c d e FilAmNation's article – Noynoy shrugs off black propaganda. FilAmNation (April 29, 2010). Retrieved on January 23, 2012. ^ a b "Villar supporter presents Aquino's 'psychiatric report'". inquirer.net. April 27, 2010. Archived from the original on April 30, 2010. ^ "Escudero distributes 'Noybi' stickers and shirts". Inquirer.net. April 28, 2010. Archived from the original on August 22, 2010. ^ Congress starts canvassing with overseas vote first in line | GMA News Online. Gmanetwork.com (May 27, 2010). Retrieved on January 23, 2012. ^ President-apparent Aquino? Sounds like royalty | GMA News Online. Gmanetwork.com (June 1, 2010). Retrieved on January 23, 2012. ^ "Final tally: Binay leads Roxas by 700,000 votes". ABS-CBN News. August 6, 2010. ^ a b c d Bahay Pangarap for P-Noy ready – The Philippine Star " News " Headlines. Philstar.com (July 30, 2010). Retrieved on January 23, 2012. ^ a b c Pedrasa, Ira. 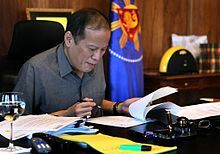 (July 20, 2010) P. Noy’s ‘wang-wang’ policy sets culture change. ABS-CBN News. Retrieved on January 23, 2012. ^ a b P-Noy’s first SONA awaited Archived July 22, 2010, at the Wayback Machine. The Manila Bulletin Newspaper Online (July 23, 2010). Retrieved on January 23, 2012. ^ Back from US, PNoy says 43K jobs to be generated in 3 years | GMA News Online. Gmanetwork.com (September 28, 2010). Retrieved on January 23, 2012. ^ a b c d e f g h i j k Bahay Pangarap: Aquino's future home?. ABS-CBN News. Retrieved on January 23, 2012. ^ a b How was PNoy’s first night at Bahay Pangarap? | GMA News Online. Gmanetwork.com (August 6, 2010). Retrieved on January 23, 2012. ^ a b c Noynoy's new home is Bahay Pangarap – The Philippine Star " News " Headlines. Philstar.com (June 30, 2010). Retrieved on January 23, 2012. ^ a b c d e f g "Briefer on Bahay Pangarap and Malacañang Park". The Official Gazette. Presidential Communications Development and Strategic Planning Office. July 29, 2010. Archived from the original on July 12, 2015. ^ Ager, Maila (June 29, 2010). "Aquino names Cabinet, takes DILG helm". Philippine Daily Inquirer. Archived from the original on June 30, 2010. ^ Ager, Maila (June 23, 2010). "Binay meets Aquino, declines Cabinet post". Philippine Daily Inquirer. Archived from the original on June 29, 2010. ^ "Binay offered new office to probe Arroyo". ABS-CBN News. June 24, 2010. ^ Davide named Truth Commission chief Archived June 30, 2010, at the Wayback Machine. INQUIRER.net (June 29, 2010). Retrieved on January 23, 2012. ^ "No Corona-tion for Noynoy". INQUIRER.net. May 24, 2010. Archived from the original on February 10, 2015. ^ G.R. No. 191002. Sc.judiciary.gov.ph. Retrieved on January 23, 2012. ^ a b "Lady justice to administer Aquino oath". INQUIRER.net. June 19, 2010. Archived from the original on October 12, 2014. ^ a b c MMDA sees positive effect of 'wang-wang' confiscation Archived July 12, 2010, at the Wayback Machine. The Manila Bulletin Newspaper Online (July 7, 2010). Retrieved on January 23, 2012. ^ a b No ‘wangwang,’ no limo, Aquino stuck in traffic Archived July 5, 2010, at the Wayback Machine. INQUIRER.net (June 9, 2010). Retrieved on January 23, 2012. ^ P-Noy late again, but no wang-wang policy stays – The Philippine Star " News " Headlines. Philstar.com (July 8, 2010). Retrieved on January 23, 2012. ^ SONA: English translation of Pres. Benigno S. Aquino III's State of the Nation Address | GMA News Online. Gmanetwork.com (July 26, 2010). Retrieved on January 23, 2012. ^ Education in the SONA Archived August 19, 2011, at the Wayback Machine. Lcc.deped.gov.ph (July 29, 2010). Retrieved on January 23, 2012. ^ Sabillo, Kristine Angeli (July 27, 2015). "2-hour Sona on Aquino gains strewn with swipes at Binay". Philippine Daily Inquirer. Retrieved January 16, 2016. ^ "Hong Kong warns against Philippines travel after deaths". BBC News. August 24, 2010. ^ "Gunman in the Philippines ends standoff by killing 8, wounding 7". CNN. August 24, 2010. ^ Noynoy declares August 25 as Nat'l Day of Mourning Archived June 9, 2011, at the Wayback Machine. The Manila Bulletin Newspaper Online (August 24, 2010). Retrieved on January 23, 2012. ^ National Day of Mourning declared for slain hostages | GMA News Online. Gmanetwork.com (August 24, 2010). Retrieved on January 23, 2012. ^ After 4 months, PNoy apologizes for slow govt response to Yolanda victims | News | GMA News Online. Gmanetwork.com. Retrieved on March 17, 2016. ^ Esmaquel, Paterno II (January 14, 2016). "'Family ties' push Canada to give more Yolanda aid". Rappler. Retrieved January 16, 2016. ^ Pres. Aquino Trying to Evade Liability in Mamasapano Incident According to Sen. Santiago. Philnews.ph (March 25, 2015). Retrieved on March 17, 2016. ^ Jaymee T. Gamil and Julie M. Aurelio (March 16, 2012). "Planking is out, 'Noynoying' is in". Philippine Daily Inquirer. ^ "Foreign media get wind of "noynoying"". ABS-CBN News. March 21, 2012. Retrieved March 26, 2012. ^ Aquino names Sereno SC Associate Justice Archived August 16, 2010, at the Wayback Machine. The Manila Bulletin Newspaper Online (August 13, 2010). Retrieved on January 23, 2012. ^ Lopez, Virgil (June 30, 2016). "Warm welcome as Aquino returns to Times Street". GMA News Online. Retrieved February 26, 2017. ^ Calica, Aurea (November 7, 2016). "Citizen Noy attends anti-Marcos rally". The Philippine Star. Retrieved February 26, 2017. ^ "Aquino joins People Power Monument protest, warns of history repeating". ABS-CBNnews.com. February 25, 2017. Retrieved February 26, 2017. ^ Tupas, Emmanuel (February 26, 2017). "Noy joins EDSA rites, denies LP destab moves". The Philippine Star. Retrieved February 26, 2017. ^ Santos, Eimor (July 15, 2017). "Ex-President Aquino faces criminal raps over Mamasapano encounter, cleared of homicide". CNN Philippines. Retrieved July 16, 2017. ^ a b c Christine Avendaño (August 13, 2009). "Sorry, Josh, Tito Noy has a girlfriend". Philippine Daily Inquirer. Archived from the original on August 31, 2009. ^ "Noynoy's 'girlfriend' being groomed for Congress". GMANews.TV. GMA Network Inc. August 12, 2009. Retrieved January 16, 2016. ^ a b "Yes, Aquino dating his stylist, Liz Uy". Philippine Daily Inquirer. November 13, 2010. Archived from the original on November 14, 2010. ^ Jumilla, Lynda (November 12, 2010). "Aquino admits dating Liz Uy". ABS-CBNnews.com. ABS-CBN Corporation. Retrieved January 16, 2016. ^ "PNoy confirms relationship status in Vice Ganda interview". Rappler. January 4, 2014. Retrieved January 16, 2016. ^ Robles, Raissa (April 21, 2015). "All the president's women: Why Benigno Aquino is still a bachelor". South China Morning Post. Retrieved January 16, 2016. ^ "Noynoy 'not yet ready' to quit smoking". ABS-CBNnews.com. ABS-CBN Corporation. May 24, 2010. Retrieved January 16, 2016. ^ "Noynoy not keen on being anti-smoking poster boy". GMA News Online. GMA Network Inc. May 24, 2010. Retrieved January 16, 2016. ^ "Obama 'to help' Aquino quit smoking". ABS-CBNnews.com. ABS-CBN Corporation. Agence France-Presse. June 10, 2010. Retrieved January 16, 2016. ^ Henderson, Barney (June 11, 2010). "Barack Obama has quit smoking for good claims Philippine president". The Daily Telegraph. Retrieved January 16, 2016. ^ a b c "Philippines, Manila, Civil Registration, 1899-1994 Image Philippines, Manila, Civil Registration, 1899-1994; pal:/MM9.3.1/TH-267-12651-66647-76 — FamilySearch.org". Retrieved January 26, 2015. ^ Filipino recipients of Japanese decorations and Japanese recipients of Philippine decorations | Official Gazette of the Republic of the Philippines. Gov.ph (January 21, 2014). Retrieved on March 17, 2016. ^ Office of the President. President.gov.ph (June 3, 2015). Retrieved on March 17, 2016. ^ Bacani, Louis. (October 9, 2014) Indonesia to bestow highest gov't award on Aquino | Headlines, News, The Philippine Star. philstar.com. Retrieved on March 17, 2016. ^ title=Briefer: Bintang Republik Indonesia (Star of the Republic of Indonesia). Gov.ph (October 10, 2014). Retrieved on March 17, 2016. ^ Office of the President. President.gov.ph (March 23, 2012). Retrieved on March 17, 2016. ^ title= President Aquino’s speech upon being conferred a Doctorate of Laws, Honoris Causa, by CEU, April 11, 2012. Gov.ph (April 11, 2012). Retrieved on March 17, 2016. ^ "President Benigno S. Aquino III's Participation at the ASEAN-Japan Commemorative Summit Tokyo, Japan". ^ title= Speech: President Aquino is conferred a doctorate in humanities from the Tarlac State University. Gov.ph (May 14, 2015). Retrieved on March 17, 2016. ^ "Philippine President Benigno Aquino III Receives Honorary Degree From LMU". Loyola Marymount University. February 18, 2016. Retrieved November 9, 2017. ^ photo 06 – 050715 Archived July 10, 2015, at the Wayback Machine. Pcoo.gov.ph (May 7, 2015). Retrieved on March 17, 2016. Wikimedia Commons has media related to Benigno Aquino III.